Get the latest news from Vizuri. FAIRFAX, Va.–(BUSINESS WIRE)–Vizuri Health Sciences LLC, a pharmaceutical and over-the-counter (OTC) product development company, today announced the formation of a partnership between Vizuri’s PainBloc24® product and the Arthritis Foundation, and the Foundation’s “Let’s Get a Grip on Arthritis” campaign. PainBloc24® will be recognized as a Supporting Partner of the campaign during Arthritis Awareness Month in May and throughout the year. Let’s get a grip on arthritis. More than 54 million Americans have been diagnosed with arthritis, which the Arthritis Foundation believes is a conservative number because many people don’t seek treatment until their symptoms become severe. An estimated one in three people ages 18-65 currently lives with the disease, and more than half of those reported that arthritis limits their activity, making everyday tasks difficult and painful. Perhaps even worse is that arthritis often forces people to give up the things they love to do and are passionate about, like a hobby, sports or favorite pastime. The Arthritis Foundation, with the help of Vizuri, is asking all Americans to support and rally around “Let’s Get a Grip on Arthritis.” Visit www.arthritis.org/LetsGripArthritis to donate and learn more about the campaign. Use the hashtag #LetsGripArthritis to join the social media movement. Privately-owned Vizuri develops and markets new innovative pharmaceutical and OTC products. The products comprise proprietary formulations that use patented technologies to enhance the efficacy and safety of natural and pharmaceutical ingredients that have proven health benefits. The company recently introduced PainBloc24®, the first OTC topical pain reliever that can help provide 24-hour arthritis pain relief with as little as one application every day. PainBloc24® utilizes a patented NeuroMax® formula, that consists of several safe, non-active ingredients that enhance the tolerability and effectiveness of the naturally-occurring, FDA-recognized, topical analgesic, capsaicin. PainBloc24® contains the highest concentration of capsaicin allowed by FDA without a prescription. It was demonstrated in an osteoarthritis knee pain clinical study that PainBloc24® can help provide 24-hour pain relief when applied one to two times every day. PainBloc24® is currently available at select drug and grocery retail stores including Walgreens, CVS, Rite Aid, Publix, Kroger, Giant Eagle, and Meijer among others. Find a retailer near you. The company is also developing prescription-strength, capsaicin products CGS-200-1 (1% capsaicin) and CGS-200-5 (5% capsaicin) that are currently being evaluated in a Phase 2 clinical study for the relief of osteoarthritic knee pain. The CGS-200 formulations contain up to twenty times greater concentrations of capsaicin than does PainBloc24®. CGS-200, like PainBloc24®, utilizes the patented, innovative NeuroMax® formula. Vizuri believes that PainBloc24® and the CGS-200 products represent promise as safer, non-addictive alternatives to opioids, steroids, and NSAIDs for the management of pain in joints in addition to the knee, thereby positioning them more broadly as potential treatments for musculoskeletal pain. Like PainBloc24®, the CGS-200 products, can be conveniently self-administered without a need for prior treatment of the affected area with cooling or a with a topical or injected analgesic. Vizuri wholly owns its patented PainBloc24® and CGS-200 products. The Arthritis Foundation is the arthritis community’s Champion of Yes. The Foundation’s goal is to chart a winning course, guiding families in developing personalized plans for living a full life while striving for a cure. The Arthritis Foundation helps people living with arthritis through its strategic pillars of scientific discovery, help and support, advocacy and access, and juvenile arthritis. The Foundation also publishes Arthritis Today, the award-winning magazine that reaches 4.2 million readers. This article was sponsored by Vizuri Health Sciences. A new topical analgesic product containing capsaicin has arrived on the retail market. Vizuri Health Sciences’ PainBloc24® is an over-the-counter (OTC) formulation intended to provide relief to patients experiencing pain associated with osteoarthritis, according to information on Vizuri’s website. Capsaicin is a natural substance found in chili peppers, and the cause of a temporary burning sensation that occurs when chili peppers are eaten. Capsaicin also relieves pain by blocking transmission of pain signals along certain nerve fibers, known as c-fibers. PainBloc24 has the highest concentration (capsaicin 0.25%) of any other OTC product, according to the website. When applied to an affected area, capsaicin-containing PainBloc24® penetrates the skin and binds to specialized receptors on these c-fibers, disrupting transmissions to the brain. According to Vizuri, pain relief increases gradually with continued use until it reaches its maximum effect after several days of daily applications. Charlie Birbara, MD, a rheumatologist at UMass Memorial Health Care in Worcester, MA, and a Vizuri board member, said repeated use of capsaicin will lead to c-fibers becoming desensitized, and they will ultimately be unable to transmit pain signals. There are no drug interactions, according to Birbara. However, PainBloc24® may cause a temporary, mild to moderate burning sensation at the application site. To minimize the risk of a reaction at the application site, Vizuri officials recommend that the area not be covered with a bandage, nor should a heating pad be used with the drug. Also, PainBloc24® should not be applied to broken or irritated skin. Users are also warned against taking a hot shower or working up a sweat immediately after the product is applied. In addition, Birbara warned that individuals taking PainBloc24® should take care that the treatment does not get in the eyes, mouth or other mucous membrane surfaces. 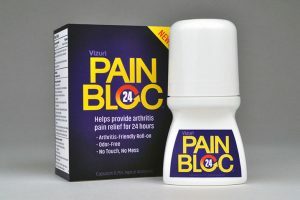 PainBloc24® can be purchased online at www.painbloc24.com, and recently entered the market in some major pharmacy retailers, including CVS. Vizuri officials are planning to launch additional capsaicin-containing products, according to a press release, including a prescription-strength formulation (1% capsaicin) currently being evaluated in a phase 2 clinical trial study for osteoarthritic knee pain relief. In support of its initiatives, the company recently received approval for a new United States patent that grants Vizuri exclusive rights to certain high strength topical CAP compositions. In a prepared statement, William Moore, PhD, Vizuri’s President and Chief Executive Officer said the United States Patent and Trademark Office has recognized the utility and advantages of the company’s unique capsaicin-containing formulations. “The (new) patent improves our ability to develop, market and protect highly safe, effective, and nonaddictive products for the treatment of numerous chronic pain conditions that affect our aging demographic, and further establishes our competitive position in the marketplace,” he said, in the statement. Vizuri Health Sciences. Frequently asked questions. PainBloc24 website. https://painbloc24.com/pages/faqs. Accessed Aug. 1, 2018. Vizuri Health Sciences LLC Granted New US Patent for Novel Topical Analgesic Formulations Containing Capsaicin [news release]. Fairfax, VA; July 16, 2018; Vizuri USA website. http://vizuriusa.com/news/. Accessed Aug. 1, 2018. FAIRFAX, Va.–(BUSINESS WIRE)–Vizuri Health Sciences LLC, a pharmaceutical and over-the-counter (OTC) product development company, today announced the issuance of a U.S. patent that further protects its capsaicin-based product pipeline. Newly issued U.S. Patent 9,956,190, titled “Topical Compositions for Pain Relief, Manufacture and Use,” grants Vizuri exclusive rights to certain high strength topical capsaicin compositions. The patent enhances the protection of the company’s established PainBloc24® OTC capsaicin product as well as the company’s prescription-strength capsaicin formulation products CGS-200-1 (1% capsaicin) and CGS-200-5 (5% capsaicin) that are currently being evaluated in a Phase 2 clinical study for the relief of osteoarthritic knee pain. U.S. Patent 9,956,190 further strengthens Vizuri’s enabling-technology patent portfolio, which to-date comprises seven issued and allowed U.S. patents, nineteen issued and allowed foreign patents, and more than thirty-five pending U.S. and foreign patent applications. Vizuri’s intellectual property portfolio also comprises the registered and allowed U.S. trademarks PainBloc24®, Vizuri PainBloc24®, NeuroMax®, and Bloc Around The Clock™. OA is the most common form of arthritis. It most frequently occurs in the knees, hips, and hands. According to the U.S. Centers for Disease Control and Prevention, in the years 2013-2015, an estimated 54.4 million (22.7%) adults had doctor-diagnosed arthritis with higher age-adjusted prevalence in women (23.5%) than in men (18.1%). The prevalence of arthritis is expected to increase in the aging U.S. population and by the year 2040, an estimated 78.4 million (25.9%) adults will have doctor-diagnosed arthritis and two-thirds of those will be women. Also by 2040, an estimated 34.6 million adults (11.4% of all U.S. adults) will report arthritis-attributable activity limitations. Inactivity due to arthritis is associated with conditions such as cardiovascular disease, diabetes, and obesity. Affected osteoarthritic joints frequently present with multiple structural alterations to bone and synovial tissue. Synovitis and increased bone marrow lesions have been associated with increased OA pain. Synovium and bone are densely innervated by nociceptive nerve fibers, which become increasingly sensitized (e.g., elicit pain signals in response to normal movements) during the progression of OA disease. Capsaicin, the naturally occurring substance found in chili peppers that makes them taste spicy hot, exerts an initial pain-dulling sensation through its activation of heat-sensing, transient receptor potential vanilloid 1 ion channels on nociceptive sensory neurons. Prolonged stimulation of these neurons with capsaicin results in sensory neuron desensitization. Vizuri’s first commercial product is PainBloc24® (www.painbloc24.com), which contains the highest concentration of capsaicin, 0.25%, permitted in a topical OTC analgesic by the FDA, and utilizes patented NeuroMax® formula technology. The innovative PainBloc24® formula contains several safe, non-active ingredients designed to enhance the tolerability and effectiveness of topically applied capsaicin. Vizuri has demonstrated in controlled clinical studies that once- or twice-daily topical application of PainBloc24® for four to seven days can provide a 24-hour reduction in the pain associated with OA of the knee. PainBloc24® is currently available at select drug and grocery retail stores including CVS, Rite Aid, Publix, Kroger, Giant Eagle, and Meijer among others. The CGS-200 formulations that are being evaluated in the Phase 2 clinical study, VZU00025, contain four or twenty times greater concentrations of capsaicin than does PainBloc24®. CGS-200, like PainBloc24®, utilizes the patented, innovative NeuroMax®formula. Vizuri believes that the PainBloc24® and CGS-200 products hold significant promiseas safer, non-addictive alternatives to opioids, steroids, and NSAIDs for the management of nerve pain in joints in addition to the knee, thereby positioning them more broadly as potential treatments for musculoskeletal pain. Like PainBloc24®, the CGS-200 high-strength topical capsaicin formulations can be self-administered without a need for prior treatment of the affected area with cooling or a with a topical or injected analgesic. Privately-owned Vizuri develops and markets new innovative pharmaceutical and OTC products. The products are based on proprietary formulations that use patented technologies to enhance the efficacy and safety of natural and pharmaceutical ingredients that have proven health benefits. Vizuri wholly owns the patented CGS-200 and PainBloc24® products. Press Release: Vizuri Health Sciences LLC Announces the Appointment of Elise Donahue to its Board of Directors. FAIRFAX, Va.–(BUSINESS WIRE)–Vizuri Health Sciences LLC, a pharmaceutical and over-the-counter (OTC) product development company, today announced that the company has further strengthened its consumer healthcare operational and transactional experience by adding Ms. Elise Donahue to its board of directors. Ms. Donahue has led the growth of several consumer product companies (including South Beach Diet, Prestige Brands International, Airborne Health, and Slim Fast/Thomson Medical, the latter which developed and marketed the Capzasin™ topical analgesic line). Ms. Donahue, also served as a Management Affiliate at the private equity fund, MidOcean Partners, and has served on the board of directors of several U.S. and Europe consumer healthcare companies. Capsaicin, the naturally occurring substance in chili peppers that makes them taste spicy hot, exerts an initial pain-dulling sensation through its activation of heat-sensing, transient receptor potential vanilloid 1 ion channels on nociceptive sensory neurons. Prolonged stimulation of these neurons with capsaicin results in sensory neuron desensitization. Vizuri’s first commercial product, PainBloc24® (www.painbloc24.com), contains the highest concentration of capsaicin, 0.25%, safely permitted in a topical analgesic OTC product by the U.S. Food and Drug Administration (FDA) according to its Tentative Final Monograph (TFM), “External Analgesic Drug Products for Over-the-Counter Human Use”. Vizuri has demonstrated in controlled clinical studies that once- or twice-daily topical application of PainBloc24® for four to seven days can provide a 24-hour reduction in the pain associated with OA of the knee. PainBloc24® is currently available at select drug and grocery retail stores including CVS, Rite Aid, Publix, Kroger, Giant Eagle, and Meijer among others. The CGS-200 formulations that are being evaluated in VZU00025 contain four or twenty times greater concentrations of capsaicin than does PainBloc24®. CGS-200, like PainBloc24®, utilizes patented NeuroMax® technology, which is thought to enhance activity by allowing the tolerable topical administration of high-concentration capsaicin formulations. Vizuri believes that PainBloc24® and CGS-200 products hold significant promiseas safer, non-addictive alternatives to opioids, steroids, and NSAIDs for the management of nerve pain in joints in addition to the knee, thereby positioning them more broadly as potential treatments for musculoskeletal pain. Like PainBloc24®, the CGS-200 high-strength topical capsaicin formulations can be self-administered without a need for prior treatment of the affected area with cooling or a with a topical or injected analgesic. FAIRFAX, Va.–(EON: Enhanced Online News)–Vizuri Health Sciences LLC, a pharmaceutical and over-the-counter (OTC) product development company, today announced the initiation of clinical study VZU00025: A Phase 2 Clinical Trial to Examine the Comparative Effects on Osteoarthritic Knee Pain of CGS-200-1 (1% capsaicin content), CGS-200-5 (5% capsaicin content), and CGS-200-0 (placebo) (www.clinicaltrials.gov). The ongoing multi-center, randomized, double-blind study will compare the effects of CGS-200-5 (5% capsaicin), CGS-200-1 (1% capsaicin), and CGS-200-0 (vehicle; no capsaicin) on pain in subjects who have osteoarthritis (OA) of the knee as defined by the 1986 American College of Rheumatology criteria. Study subjects will be randomized to receive four consecutive days of either CGS-200-5 (N=40), CGS-200-1 (N=40), or CGS-200-0 (N=40) treatment and will then be followed for an additional 90 days. Pain will be assessed throughout using the Western Ontario and McMaster Universities Osteoarthritis Index (WOMAC) and Visual Analogue Scale (VAS) methods. Efficacy, tolerability, and safety assessment data will be collected on Day 1 through Day 5 and then again on Days 19, 35, 64 and 94. Investigators, site staff, and contract personnel will be blinded to treatment assignments throughout the study. Vizuri’s first commercial product, PainBloc24® (www.painbloc24.com), contains the highest concentration of capsaicin, 0.25%, safely permitted in a topical analgesic OTC product by the U.S. Food and Drug Administration (FDA) according to its Tentative Final Monograph (TFM), “External Analgesic Drug Products for Over-the-Counter Human Use.” Vizuri has demonstrated in controlled clinical studies that once- or twice-daily topical application of PainBloc24® for four to seven days can provide a 24-hour reduction in the pain associated with OA of the knee. PainBloc24® is currently available at select drug and grocery retail stores including CVS, Rite Aid, Publix, Kroger, Giant Eagle, and Meijer among others. The CGS-200 formulations that are being evaluated in VZU00025 contain four or twenty times greater concentrations of capsaicin than does PainBloc24®. CGS-200, like PainBloc24®, utilizes patented NeuroMax® technology, which is thought to enhance activity by allowing the tolerable topical administration of high-concentration capsaicin formulations. Vizuri believes that PainBloc24® and CGS-200 products hold significant promise as safer, non-addictive alternatives to opioids, steroids, and NSAIDs for the management of nerve pain in joints in addition to the knee, thereby positioning them more broadly as potential treatments for musculoskeletal pain. Like PainBloc24®, the CGS-200 high-strength topical capsaicin formulations can be self-administered without a need for prior treatment of the affected area with cooling or with a topical or injected analgesic. From National Harbor to downtown Silver Spring, Fair Lakes-based The Peterson Cos. has been behind some of the most transformative real estate developments in the region. Now the company is working to make a national impact in a completely different market — by developing health products for seniors. In recent months, its biotech venture called Vizuri Health Sciences LLC has gained a toehold in the massive market of over-the-counter drugs, inking several deals to get its first pain relief product on pharmacy shelves across the country. With those deals, Vizuri seeks to tap into the $700 million topical analgesic market and capture growing demand among an aging population seeking alternatives to opioids, said Rick Peterson, who oversees The Peterson Cos.’ growing list of non-real estate holdings. “What we like to say is we bring cost-effective, natural alternatives to the market that allow baby boomers to age gracefully,” he said. How the heck did a development company get into the health world? Peterson Cos. has invested in all manner of things over the years, from a shrimp farm in Belize to “National Geographic Encounter: Ocean Odyssey,” a digital experience in New York City’s Times Square. Peterson said this venture into health care dates back well over a decade, to his father Milt’s 50th high school reunion, where he reconnected with old friend Dr. Charlie Birbara, the high school valedictorian. About five years after the reunion, Birbara — a pain physician who also ran clinical trials for drug companies — told Milt about a skin repair compound created by his brother and former NASA chemist Phil Birbara. The compound, called apigenin, is a nutrient typically found in fruits and vegetables. The Birbara brothers were seeking funding and business expertise. The Peterson clan grew intrigued and decided to invest, said Rick Peterson, declining to disclose their initial investment. Within six months, Rick said the project was taking up half of his time and within the year, his team knew it needed to create a new company. “It was clearly a biotech startup venture that had both [over-the-counter] consumer product as well as [prescription] possibilities due to the innovative patentable science behind it,” Rick Peterson said. They dubbed their startup, founded in 2009, Vizuri. Peterson ran the company from the Peterson Cos.’ Fair Lakes headquarters for several years, evolving the science and obtaining the patents until the team was ready to develop a go-to-market strategy. 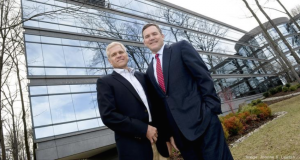 They brought on biotech veteran William Moore to serve as Vizuri’s CEO and president. They brought on experts in patents and marketing. They opened an office at the University of Maryland UM BioPark incubator in 2014. Even as they were working to take apigenin to market, Phil Birbara came up with another patented product. This one was for pain relief using a common ingredient known as capsaicin, the active component in chili peppers that makes them hot. Other over-the-counter pain relievers use capsaicin for pain relief, but only in small concentrations because the burning sensation it causes is often intolerable. Birbara, however, invented a product with the highest concentration of capsaicin allowed without a prescription — minus the side effect. They named it PainBloc24. 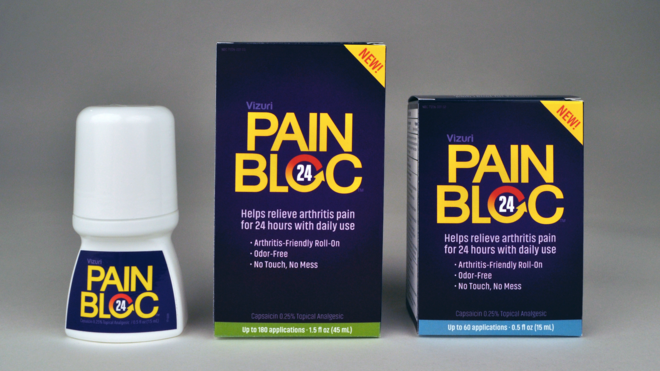 PainBloc24 is the first product created by Vizuri Health Sciences and recently made it to the shelves of major retailers like CVS Health. Vizuri, a Maryland biotech startup, was created from an investment by The Peterson Cos. Seeing a faster pathway to market with PainBloc24, the Vizuri team reprioritized it over the apigenin product, Rick Peterson said. In September, Vizuri piloted PainBloc24 in a chain of New York grocery store pharmacies and began growing from there. This quarter, the company said, the product expanded to 15,000 stores around the country, including CVS Pharmacy, Rite Aid Pharmacy and Kroger. The product sells for between $9 and $18 a bottle depending on the size. “I find myself looking for it in any store I go by now,” said Rick Peterson, who recently spotted it on a CVS shelf at National Harbor. The team hasn’t yet published its clinical studies documenting the effectiveness of the product but expects to within the next three months. Those will demonstrate, he said, that it offers 24-hour pain relief. Vizuri also launched a process with the Food and Drug Administration to win approval for a prescription-strength concentration of PainBloc and are seeking a pharmaceutical partner for that effort. They are submitting clinical safety data gathered in a trial run in both the U.S. and the Dominican Republic and hope to have phase 2 clinical data by the end of the third quarter. And Vizuri is now returning to the original compound that launched it all, apigenin, which it plans to market as a product called Skin Defense to be used for healing burn wounds or the treatment of dermatological conditions such as rosacea, which causes redness and visible blood vessels on a person’s face.